As a fluffy elephant, I’ve noticed you monkeys are in the habit of being bang-up sure things are going to turn out well. Even when they’re not. It CAN be useful. Having evolved the ability to imagine the FUTURE, you’d all be plunged into clinical depression without it. Government Health Warning – I won’t get cancer. Speed limits – I’m a safe driver! 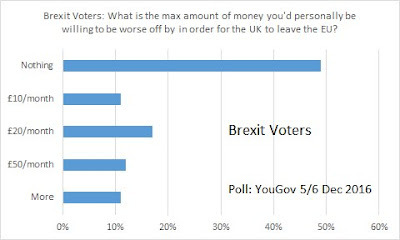 Brexit cliff-edge ahead – Project Fear!!!! So, a year into this Brexit shambles, and with the government making an art form of “masterly inactivity”, leaving things till WAY after the last minute, some Quitlings* are taking “nothing is happening” as a SIGN that really – really! – things are working out OK after all. This, as they say, is FINE. The leading lights (in the moth to flame sense) of the Vote Leave campaign are of necessity becoming adept at PIVOTING their arguments. “a 52-48 referendum this would be unfinished business by a long way” (farrage) was swiftly transformed into “the will of the people”. “No one is talking about leaving the Single Market” (hannan) has become “Everyone knew we would leave the Single Market”. And now “We will be better off” is being rebranded as “We all knew there would be a period of adjustment” with a view to ending up at “Everyone accepted there was a price worth paying” (especially since we expect our kids to be paying it long after we’re gone). That is – notice – RETIRED Quitlings saying they “accept” one of their family who is still working to PAY FOR THEIR BADWORD can lose their job to satisfy their ideological fix. But in spite of being thrown under the bus by Generation Baby Boom(and Bust)er, we still see responses of DENIAL from people who are just too OPTIMISTIC to see the warning signs. No damage? Not noticed anything? Do you notice your electricity price? British Gas are putting up prices by 12%. You can link that directly to the fall in the £, because energy is priced in $ so our costs have shot up. Do you notice your food? Those “great” trade deals on the table – well, it appears accepting American food hygiene standards means washing chicken in bleach because they don’t have the animal welfare standards that Europe does, and just try to kill all the bugs at the end of the process. Do you notice your holidays? People going on holiday seeing four hour delays to enter Europe. That’s just a taster for what happens when we close our borders. That “taking back control” goes both ways. Do you notice the big picture? Growth is down to a puny 0.3% - we’ve gone from the strongest economy in Europe to the weakest. So much for Europe “holding Britain back”. Thousands maybe tens of thousands of jobs going from the city to Paris and Frankfurt. Oh they’re only bankers. But highly paid bankers who contribute a lot in taxes to paying for our services. The Chancellor has a £25 billion hole in his budget. (says independent IFS report) That’s bigger than £350 million a week… no sign of that for the NHS yet either by the way. Do you notice the NHS is in crisis? 40,000 shortfall in numbers of nurses because – surprise – the nurses from Europe took those people saying “go home” seriously. Do you notice that no one knows how to solve the problem of the border with Ireland? Because it’s impossible. You simply cannot have a hard border with the EU and soft border with the Republic at the same time because the Iris border IS the EU border. Expecting the Irish to implement expensive and dubious electronic tracking to make it easy for us to leave, or worse telling the Irish that we will put British customs points in their ports (as though there hasn’t been 300+ years of conflict over exactly that sort of behaviour) is not approaching a solution. It’s making things worse. Speaking as someone who was in Manchester when the Arndale was blown up AND in Canary Wharf the day THAT was blown up, I’d really like us not to mess up the peace process. Did you notice that our power and influence in the world has evaporated? We lost that vote because the EU members who we have just rebuffed all abstained. Did you notice Cornwall got shafted? Don’t count on those promises that subsidies would be replaced like-for-like. Leave-voting Cornwall was getting £60 million in EU regional development fund money. They asked the government to guarantee it would be replaced. The government just flat refused to say that they’d be making sure regions didn’t lose out when we leave Europe. George Osbourne was promising money to Cornwall in his last budget saying “when the South West votes blue, their voice is heard”. Maybe not so much these days. Did you notice that the government just FORGOT Gibraltar? And last, do you notice anyone, anyone at all taking charge? We’ve wasted a year, had a pointless general election that left the country even more confused and divided. And the Prime Minister’s gone on a walking holiday – or taken a hike – while the Cabinet are all fighting each other. This is a total disaster. An utter dog’s breakfast of a Brexit. REALLY what is your excuse for not noticing? The answer to Daddy’s question is these people are EMOTIONALLY invested in their vote. FACTS that say this was a BAD CHOICE are personally HURTFUL. 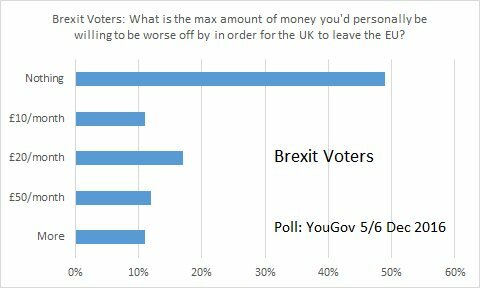 Nearly HALF of Leave voters say that DO NOT WANT to pay a price for leaving. The only way to square that circle is to avoid the evidence altogether. So they protect themselves from getting hurt by NOT NOTICING. It’s an EXPLANATION. But not an EXCUSE. Democracy – REAL Democracy – requires active and, more importantly, INFORMED participation. But people don't WANT to be informed. As we've seen, people don't LIKE facts when the facts are painful. So they get NEW facts that agree with their decisions. 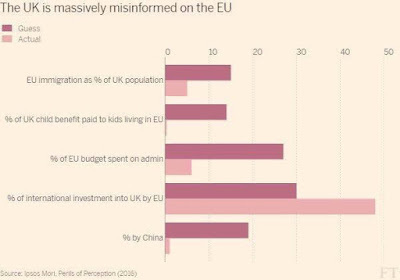 That's why most people are so widlly MISinformed about Europe and the EU. That's why the referendum we were given was a SHAM, bodged together as a fix-all for the Conservatory Party by Mr Balloon, and now taken as an excuse to escalate her personal grudge against the European Court of Justice by Mrs Mayhem. If we are going to fix this – and MY optimism bias says we CAN fix this – we are going to need to turn our arguments around, show people that the BETTER Way is now clearly to make up with Europe, retake our place IN the community with our FRIENDS. We need to win the OPTIMISM and then we will WIN.